When developing a new wireless product there is one decision that matters most. This decision not only affects technical specifications like transmission range, battery life, signal quality and product size, but it also dictates where you can even sell the product. This priority one decision that you must make as early as possible is the selection of the carrier frequency. This is the frequency of the signal that is used to “carry” the data from one device to another. Granted an electrical engineer will be needed for this process, but any entrepreneur or startup developing a wireless product should also understand the process at a high level. The choice of frequency can have a huge impact not only on performance, but also on your ability to sell your product outside of your own country or region. Choosing the frequency gets really complicated if you plan to sell your product in multiple countries, and especially if sold worldwide. Multiple radio frequencies are allowed around the world, and each country has its own set of rules. Transmitting on many of the available frequencies requires the device’s operator to have a special FCC license similar to radio stations, TV stations, and HAM operators. No operator’s license is required for receiver-only products, like a radio, or GPS. Table 1 below lists some of the more common unlicensed frequency bands. It shows unlicensed bands that are available at both low and high frequencies. However, any frequencies lower than 27 MHz are prohibitive for most products because of the large antenna size required. Although some applications still use a low frequency with a non-optimized antenna length. A low-cost, remote control car that I recently wrote about uses 27 MHz but with an antenna much shorter than the ideal length. Frequencies higher than 5.8 GHz don’t have enough range, especially for indoor applications. For most products a frequency between 433 MHz and 5.8 GHz is ideal. The rules can be quite complicated, especially for any frequencies not classified as “worldwide”. For example, 433 MHz is normally thought to not be available in the U.S. because it is considered a licensed frequency that is only used by HAM operators. However, under part 15 of the FCC regulations if the device only transmits data at very low duty ratios and if the transmission power is kept below a certain threshold then a product can operate at 433 MHz in the U.S. 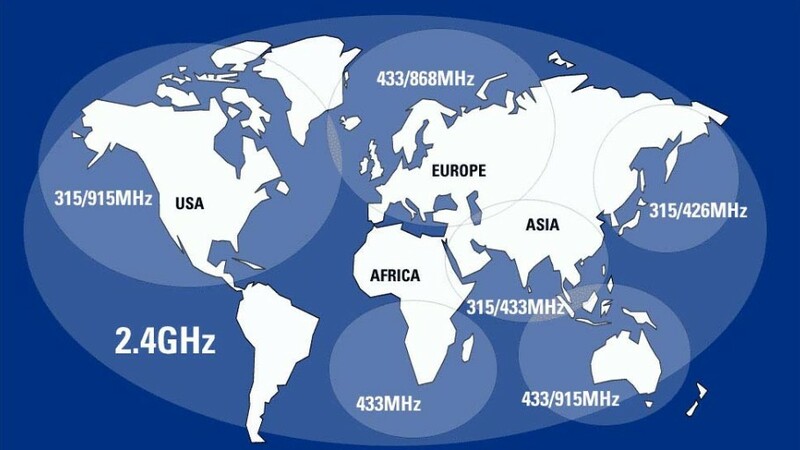 So for certain types of products, 433 MHz can offer a worldwide solution. In fact, I recently designed a radio system using 433 MHz that will be used worldwide. Another example is the Family Radio Service (FRS) band that is used mainly by walkie-talkies to transmit up to two miles. This band is only for use in North America. Originally it was only for voice communication. But GPS maker, Garmin, got the FCC to modify the rules to allow transmission of GPS coordinates over FRS for their Rino line of GPS/Radio products. Lower frequencies will go further than a higher frequency signal for the same amount of transmission power. RF receivers are more sensitive at lower frequencies which also helps increase the range at lower frequencies. There is a proportional relationship between transmission range and frequency. For example, a product operating at 433 MHz will have a range 5.5 times (2,400 / 433 = 5.5) larger than one operating at 2.4 GHz for the same amount of transmission power. The transmission power can be increased at higher frequencies to help compensate for this fact, but there are limits placed on the maximum power allowed for various bands depending on the region. The higher frequency bands have larger bandwidths which allow the transmission of larger amounts of data simultaneously. Bandwidth is simply the range of frequencies that can be used for a certain band. For example, the 2.4 GHz band allows frequencies between 2.4 GHz to 2.5 GHz, which gives a bandwidth of 100 MHz. But if using 433 MHz your available bandwidth is only 1.7 MHz (433 MHz – to 434.7 MHz). WiFi, for example, which has a very high data transfer rate, uses both 2.4 GHz and 5 GHz to reduce interference and increase bandwidth. As shown in table 1, the higher the frequency the smaller the antenna. This fact, along with higher data transfer rates, is why 2.4 GHz has become so popular as product sizes continue to shrink. Bluetooth, WiFi, and countless cordless phones and baby monitors use 2.4 GHz. The primary limitation with 2.4 GHz is the reduced range compared to lower frequency bands. At lower frequencies the antenna size becomes so large as to be prohibitive for many products. Some bands are very crowded, especially 2.4GHz, making sensitivity to interference a real problem. Techniques such as Frequency Hopping Spread Spectrum (FHSS) allow designers a way to avoid interference problems. FHSS is what allows Bluetooth and WiFi to operate simultaneously at the same frequency without interfering with each other. A FHSS system constantly hops between frequencies (within the defined band) so any interference is only a short momentary issue. One final consideration is battery life. For a given range, the lower the frequency the lower the necessary transmit power. So more transmit power will be required at higher frequencies which drains batteries faster. In many wireless devices the power used to transmit a radio signal is the largest drain on the batteries. However, the lower frequency necessitates a larger antenna which then leaves less room for the battery. There is no doubt that selecting a frequency is a complicated process, unless your application requires a protocol with a predefined frequency, such as with Bluetooth, WiFi, and ZigBee. If your product doesn’t use one of these standard protocols then you have many options to consider when selecting the right transmission frequency. According to CFR 47 Part 15.231 low power periodic devices are allowed on 868 MHz. Or am I reading it incorrectly? Great article! I have seen many of our customers faced this problem when they come to us for fixing wireless connectivity issues and passing operating standards. In the US the 315/915 freq, are all devices able to transmit these freq’s to be prepared for new technologies as they hit the market? Cell phones, tablets extra….. I am developing a new product and your article has been very helpful. Hi, The article was very informative. I want to know whether we can operate in frequency bands other then 2.4Ghz and 5Ghz and still use Wifi? I’m gathering info on 433 license free usage worldwide and have some doubts that you may help me solve. How can you be sure that 433MHz is license free in Asia? In Europe and ITU region 1 it’s ISM band, but in Asian countries normally you need to check local regulation, as region 2 doesn’t have 433 as ISM. I’m currently studying towards a degree in Computing and IT – The article “The Most Important Decision You Must Make When Developing a New Wireless Device” was very formative and exciting to read. Thanks Andy, I appreciate the positive feedback!